Special Guest Author, Minister, Motivational Speaker, Vendor, etc. 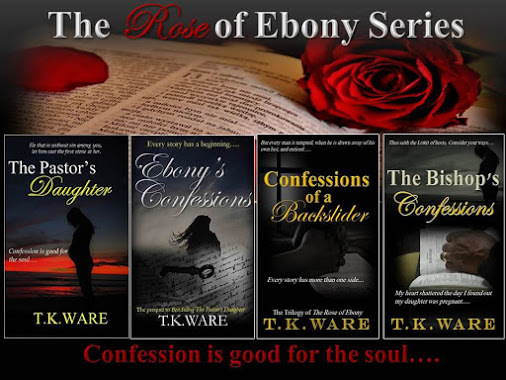 T.K.Ware will bless you with his Testimony!! A young woman shares a gut-wrenching testimony. As the year comes to an end, I found such delight in exploring the canvas of my creativity. 2017 shall be a year of no restraints, as I stepped outside of my comfort level. For you next inspirational read or a gift for someone, feel free to visit the website and snatched up a insightful creation. Are you able to dictate how every aspect of your life would turn out? What about if you are a believer, can you pray your way into the path that you desire? Web Of Allure: A House Divided Cannot Stand by Tshombye Ware is a robust, explosive and engaging short story about how quickly one small indiscretion can take a turn for the worst. Web Of Allure tells about how the lives of Jake and Jennifer began like a fairy tale. They had everything from God being the head of their lives, and a beautiful marriage, to living the careers of their dreams. Jake’s and Jennifer’s lives were blessed every step of the way. Little did they know that what seemed to be a blessing could also created a mark, or curse, on their marriage. Would they be able to escape the web of deception and the lure of the traps that had been set for them? The decisions that we make today affect not only us, but those around us and our future. In reading Web Of Allure: A House Divided Cannot Stand by Tshombye Ware, I was able to see how the ebb and flow of marriage can be extremely challenging. We think that when no one is looking, like our spouse, that something as simple as dipping a toe into temptation is harmless. Web Of Allure: A House Divided Cannot Stand by Tshombye Ware shows that despite your faith, and how much you pray, you must be prepared to overcome obstacles along the way. Don’t let the trappings of this world cloud your character. Every now and then a writer stumbles upon an unexpected publication. When I wrote the first book I thought I was finished. As days turned into month, I heard the other characters in the crevices of my mind. They spoke with such potency that I rushed to the closes writing object and jotted down their confessions. A proven fact is that every story has more than one side. It’s rare when you get to hear from all parties involved. Each character told the story from their point of view. In the end, you will see the story as a whole.